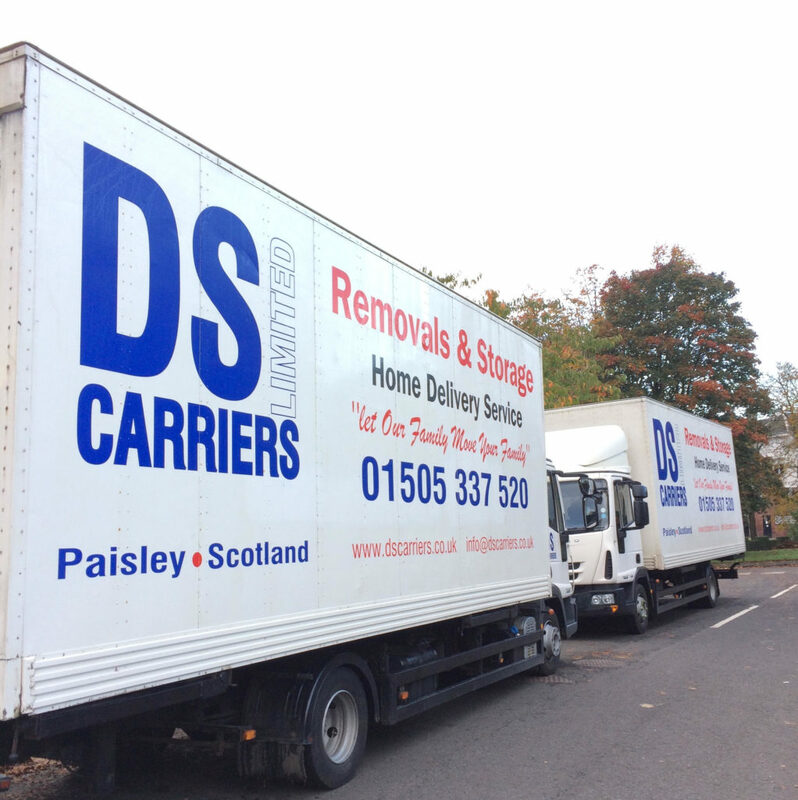 DS Carriers are the Glasgow Removals firm that local estate agents recommend. Whether it’s moving couples to new apartments, families to new homes, or parents to care homes. Every move DS Carriers assists with goes without a glitch. Belongings packed with care, then unpacked meticulously too. We don’t just move furniture, white goods, and valuables. We plan your move with you before moving day, then show up when agreed and take care of your entire moving day. We have 35-years experience in Glasgow removals. Our family continue to serve families around Glasgow, making home moves a breeze. From partial to full removals, furniture dismantling and anything else we can help with… we always work with precision and care that allows our business to thrive just through word of mouth around Glasgow. Glaswegians trust us because we take the time to listen, communicate pleasantly and never rush the job. Can we pack your items for moving in Glasgow? Can we dismantle your furniture for your move? Do we offer storage in Glasgow for between moves? All Glasgow removal services provided by DS Carriers are tailored to suit your requirements. You can have us supply you with the boxes and materials you need to pack for our team to remove and move. Or, we can bring the boxes, protective packaging material and package all your valuables for maximum security during transportation. • Quilted sofa covers provided and used to ensure your sofa arrives in your new home the way it left your old house. Our team are meticulous with every item handled. Whether that’s your treasured family photos, prized trophy or other awards, white goods, small appliances or any of your furniture – large or small. Our attention to detail is second-to-none. Our goal is always to make our customers’ move as pleasant as possible. We go out of our way to make that happen. We aren’t just a Glasgow removals company. We’re there to serve your every need. When it comes to home removals (Glasgow or moving further afield), you’ll have more to do than spend your days dismantling furniture, rendering them dysfunctional until after your move is completed. Our team are experienced at dismantling and reassembling any furniture you’d like us to. Any flat pack furniture you have that you’d rather not dismantle, we’re experts at furniture removals. To make our pack and move service cost-effective, we only charge a flat-fee regardless how much packaging materials you need. At DS Carriers, we understand there is sometimes a time gap between handing in your keys and collecting the keys to your new home. We have our own self-storage facilities in Renfrewshire and work with numerous storage partners on a daily basis. Whether you need items stored for a weekend, a few months or longer, we have the secure facilities available for your convenience. Put our storage solutions to use if you need some to cover a time gap or redecorate. Or for peace of mind, know that if anything delays your moving in date, our Glasgow storage facilities are there and available at a moment’s notice. Our family have been providing Glasgow removals services for generations and are proud to have established partnerships with some of Scotland’s household store names including Harvey’s furniture and Benson for Beds. In addition to our furniture removals service, our team are on hand to assist with any office removals – Glasgow and surrounding areas or relocating elsewhere nationally. 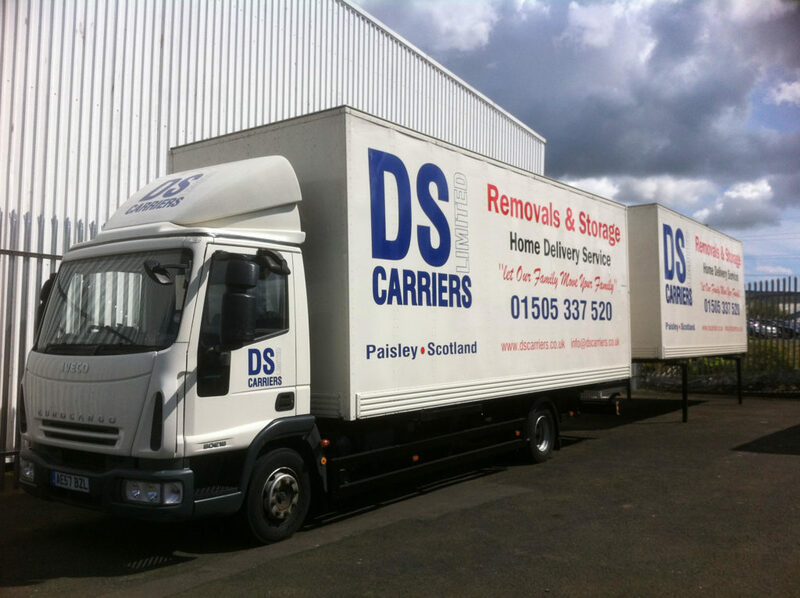 Whether you’re a small Glasgow local business relocating office, or a landlord requiring end of tenancy clearances, and/or require storage solutions temporary or longer-term, DS Carriers are here and ready to serve when you need us to. Removals is what we do. Customer satisfaction is what we care about. We are in no doubt that whatever your needs, you’ll join the large number of satisfied customers our family at DS Carriers have been proud to have served over the 3+ decades we’ve been moving families in and around Glasgow, with national relocations taken care of smoothly as well.